German Shepherds for sale: find the perfect German Shepherd dog for showing, breeding, training, or, the best work a dog can dream of, being a family companion - here. On this page we occasionally offer adult German Shepherds for sale, who are past the wonderful stages of housetraining and learning house manners. These German Shepherd dogs come from world-class German bloodlines and are carefully selected after days and weeks of research. When we have an adult German Shepherd dog available that was bred in our kennel, you are looking at the pick of the litter that we selected after two months of frequent daily interactions with the puppies. When welcoming an adult German Shepherd dog into your family, a few things have to be kept in mind. First of all, your new dog already has formed a set of habits, not all of which you will find appropriate or compatible with your lifestyle. But you can certainly teach new tricks to an old dog, especially such an intelligent breed of dogs as German Shepherds. Be very consistent and patient - your dog will learn very fast. Secondly, even if your dog is very well trained, do not expect her to be immediately obedient. The fact is that your new German Shepherd dog may not even respond to her name, because your pronunciation is different from what she is used to hearing. Be patient with your new dog, use common sense, and in about a week or two you will notice a huge difference in your dog's behavior and responsiveness to you. Don't forget to take your dog for walks - German Shepherds usually enjoy walking with their "pack" and walking with your dog is a great bonding opportunity. If you do not find here the German Shepherd that you are looking for, please let us know and we will try to help. Call or e-mail for prices and additional information. Tinka came to us from Germany at a tender age of 9 weeks, and stole my heart immediately with her superb jet black pigment, mahogany markings, powerful head and strong frame. She developed into a top young female and is a SE Region Siegerin. From there she just blossomed into a wonderful female with huge heart, so attentive and loving. She is a hard worker, incredibly smart, and is my training partner, as I trained and titled her myself, first here in the US, and then we went on to compete in Germany, earning her IPO2 title and Körung, and competing in the World Championship Show (BSZS). Her fantastic temperament and working ability made it a true joy to train with her and she was awarded 4,4 scores for her courage test in BSZS. In conformation, Tinka is very large, with high wither, beautiful top and under line, correct proportions, and excellent angulations front and rear. Powerful movement is another great asset of hers. Tinka is linebred 3-3 on VA1 (World Champ.) Zamp vom Thermodos and 4-5 on VA1 (World Champ.) Ursus von Batu. Yoschi is a large and very well put together, gorgeous young female from our top producing Kreislauf Palmas. She is darkly pigmented, and has beautiful black/red colors. Yoschi is easy to train and is housetrained and started in obedience and is making excellent progress. Very strong pedigree with Double World Champion VA1 Vegas du Haut Mansard, Double World Champion VA1 Remo vom Fichtenschlag, VA2 Quenn vom Löher Weg, VA5 Orbit vom Hühnegrab in the first four generations. Full pedigree. Zima is a powerfully built and and beautifully proportionate female with strong chest and bone, good angulations, and powerful movement. Zima has a kind and fun-loving personality. She loves life, loves going places, and has very good drives. A rare opportunity to own such a promising female from the world-famous Yuri, before he was sold from Germany to China. Zima has a very interesting pedigree with VA Yuri - VA Mentos - VA NAndo, as well as Nicos vom Leithawald and Idol vom Holtkämper Hof on her father's side, and double world champion VA Remo, VA Wendy von der Piste Trophe, and VA Dux de Cuatro Flores on her mother's side. We are expecting great things from Zima! Pablo is an up and coming young male - expressive, and with stunning, glowing-red markings. He is powerfully built, with high whither, correct angulation front and back, and powerful, fluent movement, so typical of his world famous parents. Pablo is out of the best female in the USA VA1 Wiva vom Zellwldrand and the young world champion himself, Arre vom Hühnegrab. Pablo has a stellar temperament - absolutely loyal, self-confident, friendly and approachable, and yet with all the right drives to complete his training. He is expertly trained in on and off-leash obedience and has recently obrained his BH. Pablo has excellent house manners, travels well, and is in perfect health. Obedience training video. Enzo is an exceptional male with deep pigment, intense red color, masculine expressive face, and excellet harmony of build. Energetic and fluent mover, he recently took 1st place at a competitive show in Florida. He is breed surveyed for life and along with his own qualities, offers a stellar pedigree with double World Champions Remo vom Fichtenschlag as his father and Vegas as his grandfather. With excellent working qualities (video available), and solid temperament, this is a unique opportunity to add a fantastic, accomplish stud dog to your breeding program, and a top quality gorgeous male to your family. Danka is our latest addition, imported from Serbia, and she boasts stellar German world class pedigree, being a daughter of the World Excellent Select Enosh, and both of her grandfathers being World Champions. Danka is a well pigmented medium sized female with correct proportions, good angulations and free movement. She is an affectionate and very sweet dog, and is a favorite with the kids visiting the kennel. Niwa is a gorgeously put together youngster with powerful head, dark, expressive eyes, correct body proportions, and excellent top line with strong back. Powerfully built with strong bone, she should grow to be a correct, medium sized female. She is a fireball of energy at this age, just the way an awesome GSD puppy should be. Her father stunned me this year at the world show both with his looks and performance, and I'm thrilled to add such a gem of a dog as Niwa to our program. Niwa won and was crowned Siegerin at the USA Sieger show 2016 in a 9-12 months class! Loki is a large and substantial male, striking with his expressive face and imposing features. He is a very intelligent, loving, and affectionate dog who wants to follow you everywhere. He is playful, outgoing, and a very pleasant companion. Trained in obedience, a good house dog, Loki comes from a line of very healthy dogs. His mom is our proven producer Jana von Lotta and his father is the perfect compliment to her with his features and temperament. Loki has a very interesting pedigree free from Remo, Vegas, and Quenn. Netzer is a rare red sable German Show male of medium size, correct proportions, substantial, and with powerful bone. Along with his incredible pedigree (all four grandparents are VA - Excellent Select), he brings to the table absolutely correct size, fantastic health, and character that is hard to match. Netzer is a confident and self-sure, powerful, yet extremely eager to please dog. His love of life and constant happy demeanor and good mood will always make your day. Additional pictures: 4months, 5months, 5months, 5months. Pascalla is a stunning, show quality, powerfully built, young female out of the best female in the USA VA1 Wiva vom Zellwldrand and the young world champion himself, Arre vom Hühnegrab. Pascalla has a solid temperament with self confidence, desire to please and good drives. Pascalla is well pigmented, with dark eyes, and shows powerful, fluent movement so typical of her world famous parents. Excellent dog for a family. Qutie has fantastic type with dark eyes and mask, beautiful deep red color, smart, mischievous expression, and excellent coat. Qutie is of medium size but powerfully built, and shows considerable harmony of build. She has high wither, pleasant topline with long croup, excellent chest proportions, and she demonstrates powerful, fluent, ground-covering movement. Intelligence, good drives and watchfulness make her fun to work with and train. Qutie's pedigree is absolutely the top of what GSD world has to offer today, combining VA Furbo, VA Alisha, VA Vegas (VA Quenn, VA Zamp, VA Pakros), VA Orbit vom Hühnegrab. Qutie is available as a watchful family dog. Additional pictures: 10weeks1, 10weeks2, 6months1, 6months2, 3years. Ulme "Sheba" is a strikingly beautifil, very large and substential female with expressive dark eyes and fantastic color and markings. She is everything a well bred GSD should be: playful, enthusiastic, very healthy, and happy. Her face lights up when she gets to meet new people, she is very obedient, and loves to play fetch. Perfect dog for an active family or anyone looking for a loving, loyal companion and a hiking partner. Linebreeding 4-4 on VA1 (World Champion) Ursus von Batu. Hamlet von Lotta is a fiery beauty of a GSD, and is a gorgeous young representative of the breed. He is large, harmoniously put together, with high wither, strong back, and beautiful movement. He has a very lively temperament, and loves to play and spend time with his people. He is trained in obedience and will do anything for treats, is house and crate trained, and travels well in the car. He is protective of his family, but reacts well to meeting strangers on a neutral territory. Father, Pic1. Mila is a very darkly pigmented red sable female with a well balanced, correct structure. She is exceptionally talented, demonstrates a very strong and confident character and is an alert, energetic dog. She has high drive, full and calm grip, and is a true star in IPO. 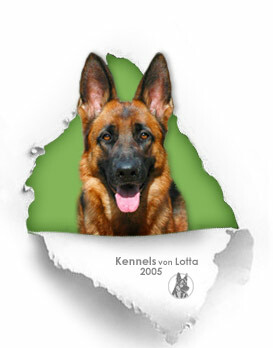 Her father, Keanu, is a Regional (LGA) SchH3 Sieger 2010 and is a son of world-famous BSP participant Ellute von der Mohnwiese, combining blood of SchH3 World Sieger (WUSV) Tom van't Leefdaalhof and V-rated BSP participant Yoschy von der Döllenwiese, my favorite working line producers. The mother, Qualle, is a granddaughter of V Nick vom Heiligenbösch, SchH3 (V-BSP, WUSV 3rd place), FH1, who goes back to V-BSP Fero. There is no linebreeding in Mila's 5 generation pedigree. With bloodlines as strong as these, we are thrilled to add a true working dog to our team! Mila's training with her co-owner Josh Markow is truly impressive. Jessy is a very powerfully built, robust female with strong bone, expressive, powerful, but feminine head, and solid, harmonious structure. Her color is red sable, which is very rare in German Show lines. She has dark eyes, very strong pigment and mahogany red markings, which make her stand out even more. She has a very sweet and friendly personality and loves to play, yet she is a good protector. We were looking for 2 years to add a sable female to our family, and are very excited about Jessy. Jessy placed VP3 at the North American Sieger Show 2009, leaving 14 gorgeous puppies behind. In addition, her full brother "Junior" became the North American Sieger! She also has a national-level winning progeny from her 1st litter. More pictures: 8 weeks1, 8 weeks2, 12 weeks, 4 months, 7 months1, 7 months2, 7 months3. Figo is one of the most handsome males I've had the pleasure to be around - very harmoniously put together, with strong masculine head, deep red color and dark pigment, perfect structure and powerful movement. He is ready for BH which is a German obedience and temperament test title, including off-leash obedience. Figo will make an incredibly handsome and loyal companion - he loves to play and spend time with his people. Picture1, Picture2. Jana is substantial and powerful, with dark eyes and lively, intelligent expression. Deep red markings add to the beauty of her very full coat. She has excellent structure, high in the withers with beautiful topline. She is a very happy, outgoing female, with fantastic drives. We look long and hard for dogs that are not only gorgeous but will also work, and Jana is such a find. While in our training program she showed unbelievable focus and instant responses to commands in her energetic performance, and achieved her SchH1 title at the earliest possible age. Jana was rated V8 at the USA Sieger Show 2012 in a very competitive class! VA1 (World Champ.) Zamp vom Thermodos and VA2 (Vice World Champ.) Odin vom Holtkämper Hof lines. video of Jana as a puppy! Pola is a very large and substantial female. She is an agile, fun loving dog who loves outdoors and is a great dog to be around and spend quality time with. Pola is well trained and obedient, and a very loyal companion. She is full of positive energy and can always light up my day with her desire to be the best dog ever. At the same time she is great to hang out in the house with, and knows how to relax and be a good dog. Pola is looking for a new family to call her own, as she is now retired from breeding and competition. More pictures: pic1, pic2, pic3, pic4, pic5, pic6. Gaban is a very darkly pigmented young male, born and raised in Germany. He is of perfect medium size and excellent proportions. Black face with intelligent and attentive expression add to his striking looks. Recently completed his IPO1 exam at the earliest possible age, and ready for Koerung, Gaban can be an excellent asset to a breeding program, or a faithful companion for a family. He is loving and attentive, and is a well-behaved house dog. Both parents have exceptional working ability, with his mom multiple times SchH3 and IPO3, and his father is also, by far, one of the best GSD I have had the privilege of meeting and working with. There were 8 males and 3 female in our "V" litter, and after much debate Vector was my pick of the litter, who now grew into a wonderful young male with so much potential. Vector is so handsome with stunning mahogany color and deep black pigment. He is a powerfully built male of medium size, with strong head, and full, powerful chest. He is very expressive, with very dark eyes, and is of excellent type. Simply put, he is gorgeous and very pleasant to look at. That's not just my opinion, he's placed very well in shows, and took a few 1st places, as well as competed sucessfully in the German Championship Show (BSZS) this year. He was the highest placing American male in his class. He has excellent presence in the ring. Vector is a fun-loving boy, very affectionate, happy, easy-going, and an excellent house dog. He gets along great with other dogs, and is very friendly, yet does have that potective instinct that can be developed further. Excellent health and the best German rating for hips and elbows, a1/a1. Rocco is a very large, strong, athletic young male, eager to play and to please. He is very expressive, with strong masculine head, and powerful frame. He is friendly, gets along great with children and other dogs and will make an excellent addition to a selective breeding program or the perfect family companion or an estate dog for a true lover of the breed. Rocco has already been trained to the level II of IPO, which includes tracking, obedience and protection, and has excellent work ethics, clear head and desire to please. A healthy dog, sturdy, and with balanced movement, he has hips and elbows with the best "a1" German rating. Rocco's father needs no introduction, world famous VA3 Paer, one of the best producers today. The motherline is also excellent. Rocco is linebred 4,5-5,5 on VA1 (world Champion) Ursus von Batu. Rocco is currently in Germany with his trainer and we can arrange for his travel to the USA or many other countries. Heidi is a beautiful, large but elegant female with inquisitive expression and beautiful coat. Heidi is an active and very athletic female, and loves to run and play and goof around. She was raised in a family with children, is fully house and crate trained, and professionally trained in obedience. She is eager to please and listens well off leash. She will form a very strong bond with her new family and will become a loyal companion. Heidi takes her job of guarding her family and territory seriously and we are looking for an experienced owner who appreciates the breeds' protectives instincts. She is a picture of health, up to date on her vaccinations, and has been spayed. More pictures: Pic1 , Pic2 . We were very lucky to have added Janni to our family, and now it is time for her to retire and live out her years as a family dog. She is a powerful and strong female of correct size, with especially strong, expressive head, dark eyes, strong bone, harmonious proportions, gorgeous top line and fluent movement! Being a huge fan of Yak vom Frankengold, I love the fact that Janni is his granddaughter, however, she also is very typical of Wallace aus Agrigento, and not surprising, as she is linebred 3-3 on him. We already had a Wallace daughter in our kennel (Sierra vom Ochsentor), and her temperament was as close to the ideal GSD as it gets for me. Janni's mother is a full sister (repeat breeding) to SG2 (BSZS) Pedro and SG1 (World champ.) Pina aus Agrigento, which also shows her strong motherline background. Janni is free from Ursus, Zamp, and Vegas. Janni was rated V3 at NASS (Excellent 3rd place at North American Sieger Show)! Wespe is a very large female with very strong bone and expressive, typical face. She combines very dark pigmentation with deep red markings. Wespe is beautifully structured with excellent top line, good length of croup, correct shoulder construction, and excellent angulation. Her gait is very wide and fluent, which is what her father, 2xVA1 Vegas du Haut Mansard, is famous for passing on to his offspring. Wespe is very smart and eager to learn, and has nice drives but not over the top. She is very attached to me and will do anything to please. Pira is a large and substantial female, with intelligent expression, strong bone, and harmonious build. She has dark eyes and well set firm ears. Pira has excellent proportions, smooth topline, and fantastic angulations front and rear. Pira is a playful, affectionate, active female who loves to learn and to work with her handler. Her SchH2 scores were 92/86/93! Diva's father is in my opinion the best son Zamp ever produced (he is also a grandson of VA1 (world Champion) Larus von Batu). Pira is linebred 4-4 on VA1 (World Champion) Yasko vom Farbenspiel, 5-5 on Max Loggia dei Mercanti, and 5-5,5 on VA1 (world Champion) Ursus von Batu. Excellent opportunity to acquire a beautiful, titled female from Germany, for breeding, training, or as an active family companion. Ursus is a strikingly handsome male with very expressive and intelligent face, impeccable structure, deep red and black color, and solid frame. He is large, at the high limit of the standard. His temperament is very lively, energetic, and outgoing. He is ready for BH and can achieve it at the earliest alowed time (at 15 months). His bitework is very strong, and he is eager to please in obedience. Ursus's hip and elbow x-rays looked really good and were submitted to the SV for evaluation. He is an excellent show, Schutzhund, and breeding prospect, but will also be absolutely happy as a companion for an active family. He comes from a top quality breeding, and we would like to thank Mr. & Mrs. Park for giving us an opportunity to bring such a fine male to the United States. Linebreeding 4-4 on VA1 (World Champion) Ursus von Batu. A rare opportunity to acquire a fantastic long/plush coated, gorgeous female from truly world-famous parents. Her 4-gen. pedigree boasts such pillars of the breed as World Champions Zamp vom Thermodos, Yasko vom Farbenspiel, and Rikkor von Bad-Boll. Having a World Champion father doesn't hurt either. Anna is especially large and substantial, with mahogany red markings and jet black color. She has powerful and expressive dark face, impeccable structure with correct proportions, fantastic top line, correct angulations, and what a beautiful mover she is! Anna is energetic, very people-oriented and friendly, has absolutely solid nerves, and will make a fantastic companion for an active family. She also has what it takes to shine in Obedience. She gets along well with males of similar size. Anna has been spayed already. Balu is a very handsome, beautifully structured puppy, with powerful and expressive head, and strong chest and bone. He stops traffic everywhere he goes! Balu's parents combine some of the most prolific bloodlines today: World Champion Vegas du Haut Mansard (his grandfather), as well as World Champions Zamp vom Thermodos and Yasko vom Farbenspiel. In addition to this, he comes from a very strong motherline. Balu is calm yet confident and friendly, very happy and content dog. He is very responsive to direction from a handler. A “photographic journal” has been made of Balu’s development. Balu has been introduced and familiarized with a wide variety of situations as shown in the photographs. Balu has proven to have solid nerves and temperament and displays excellent character around children, adults, dogs and cats. Balu is “well balanced”, that is, he is alert, confident, friendly, curious, playful and calm. It would be hard to find a better socialized dog than Balu. He will be a great companion and family dog. His photos and a detailed description can be found on his Facebook Page. If you are not a Facebook user, send us an e-mail for more information. Quana was imported directly from Germany as a puppy. She has a very alert and intelligent expression, with perfectly set ears. She is an especially large female and is often mistaken for a male. Quana has excellent harmonious structure with smooth topline, straight back, nice long upper arm, and correct angles. Her movement is free and fluent, and she was V (Excellent) rated at a regional German Shepherd conformation show. She is also breed-surveyed for life with Körklass 1. Quana's character is very stable, self-sure, friendly, and she is ready to play whenever you are. Quana is a loyal and very social family companion and protector, and is a very healthy dog. She loves training with me, - whether it is tracking, obedience, or protection. Quana is extremely intelligent and will make a wonderful addition to a family or a partner for someone who wants to practice training. She gets along well with male dogs of comparable size. Fanta is a very easy-going and friendly dog. She is completely housetrained, and crate trained, although she doesn’t need a crate – you will hardly notice she is in the house. At the same time, she really blossoms when taken for a walk, for a ride, or, her favorite, to swim after her ball or just a stick thrown into the lake. Fanta is very obedient, and does a beautiful motivational obedience routine on and off leash. She is also very well trained in tracking and formal protection, but being a very good-natured dog, she doesn’t always bark at a passing stranger. Fanta was trained in Germany as an adult, so we know for a fact that she can quickly form a close bond with her new family. She gets along very well with male dogs, but not always females. She is not a breeding female and she is not a good candidate for a family with cats. We are looking for a responsible adult owner for Handra who appreciates true working dog character. She is extremely smart to the point that she makes me laugh, and she can be your best friend. We love Handra very much, and this is not an easy decision, but we feel she can have a much better life as an only, inside dog. She gets along great with male dogs, but not always with females. Please contact us for more information. Akita is a very large and strongly built female with nice structure. She is confident, full of energy and is very playful. At just 1 year old, she is already a great watch dog. Both her parents combine great working characters with correct structure. Akita is very typical of her world-famous father, with good strength of bone, deep red color with strong pigment. Her head-type is unmistakably typical of Erasmus, with very dark and expressive eyes, strong expression, and large, correctly set ears. Her mother-line is remarkable too, as it has produced several VA females in the recent past, with very good working characters. Akita is currently working on her BH and SchH titles. Sierra is a stunning, especially large and substantial female with excellent structure, magnificent huge head and very strong bones. She has a serious expression with awesome dark eyes and beautiful correctly set ears. Sierra is extremely outgoing, confident, and energetic. Her drives are perfect, and she is crazy for her ball. She is an excellent family dog: great manners in the house, great with kids and our guests, but protective when nececssary. She comes from the famous Ochsentor motherline, which has produced several VA females in recent times. Sierra was very highly rated (Excellent, 3rd place) at the North American National GSD Show (NASS) at 5 years of age, after being imported to the USA. This website was created by Template-Online.com All rights reserved.